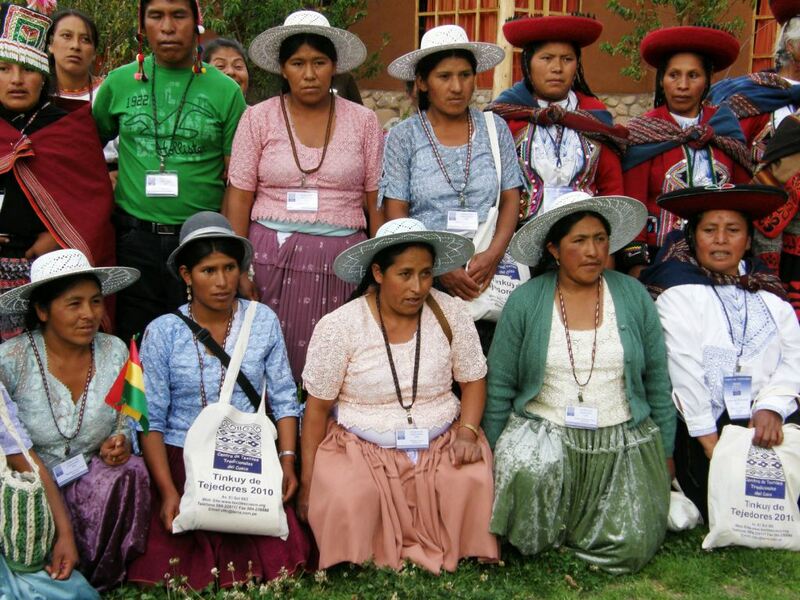 The Center for Traditonal Textiles in Cusco (CTTC) reaches across the world, showing and telling, promoting and sustaining the work of weavers on simple looms in remote communities of highland Peru. This piece was bought from founder Nilda Callañaupa herself when she visited Bothwell, Tasmania in 2007. One of the people who came to weave with me a few weeks ago here in Sydney had been to Peru and came with bags and pieces still on the loom with those distinctive Chinchero patterns woven with handspun naturally dyed yarn. One of the other ladies immediately picked up her smartphone and started searching for the site from which she could buy these items. Show and Tell…spread the word! 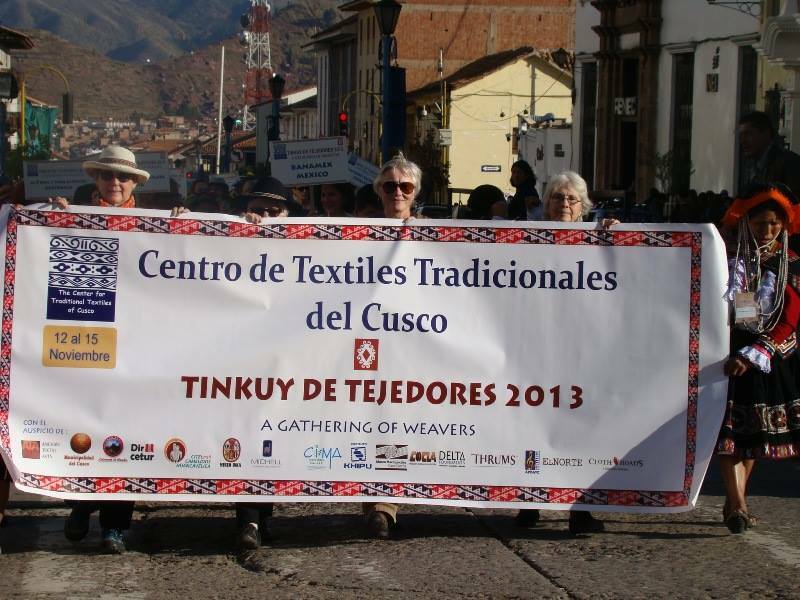 One of the greatest Show and Tell events in my world of weaving was held last month in Cusco. The CTTC hosted its second Tinkuy de Tejedores, a gathering of weavers from across the Americas and even from as far away as Asia. I couldn’t go this time but have heard a few reports from friends. Dorinda, who works with weavers in Cochabamba, Bolivia went with one of my weaving teachers, Maxima. Maxima took workshops and learned three new figures in a backstrap weaving class as well as the ñawi awapa edging. It was something she had been wanting to learn for years. Her sister knew how to do it but I guess she hasn’t been nearby to teach it to Maxima. Finally, the curiosity has been satisfied and I look forward to seeing Maxima put it to use. Dorinda’s PAZA website is currently down but she tells me that she has four blog posts prepared with details of the trip ready to go up once the problem is fixed. Who doesn’t like Show and Tell? In the guild meetings that I have attended so far in the US and Australia, this has always been my favorite part. 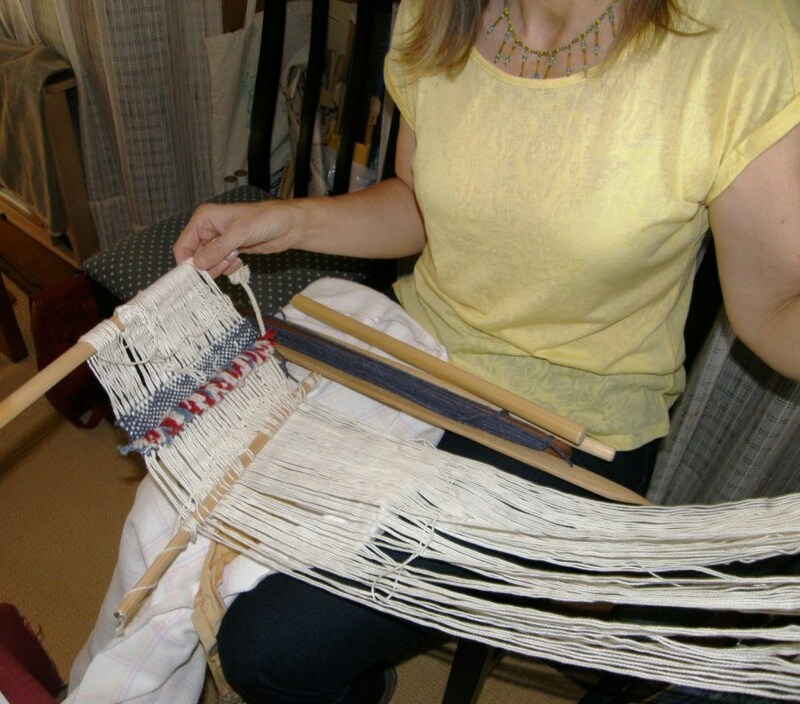 I am a member of several online weaving groups and we do our share of show and tell on a daily basis. 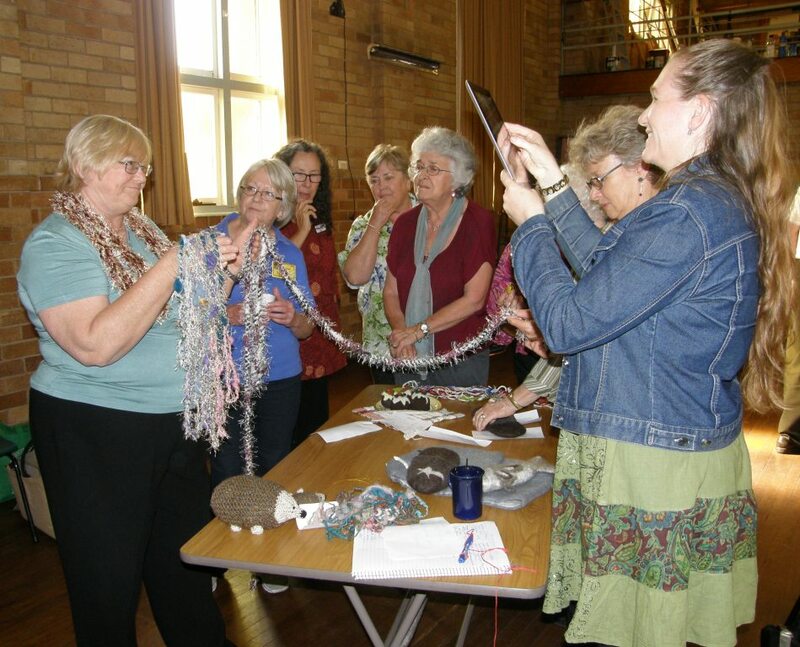 Some of the larger groups, like Warped Weavers on Ravelry, can have dozens of projects presented in a single day. There is always something to learn. But, of course there is nothing like being able to actually handle the fabrics and yarns and listen to the weavers and spinners’ enthusiastic descriptions and explanations. I spent a nice Saturday in the lower Blue Mountains last Saturday at the home of weaver Helen (author of the electronic newsletter, Weavers Forum). Helen has a nice group of about fifteen mountain weavers and spinners who regularly meet at her home for fiber talk, lots of laughter, occasional workshops and, of course, show and tell. That’s yet another reason for me to consider settling in the mountains should I ever come back to Australia to live permanently….the aromas and colors of the bush, the bird song, the cicadas, the coolness,….and a lovely community of weavers! Lorette brought along a backstrap loom that she and a few friends had put together some years ago with its unfinished project. Just when I am taking home tools for knotted pile weaving and wondering if I am mad to be thinking about doing it on a backstrap loom, along comes Lorette with her Show and Tell. She showed me that yes, it is do-able and that she was able to produce nice firm and well beaten rows of cut pile. I wonder if she has found the inspiration to finish this project now. 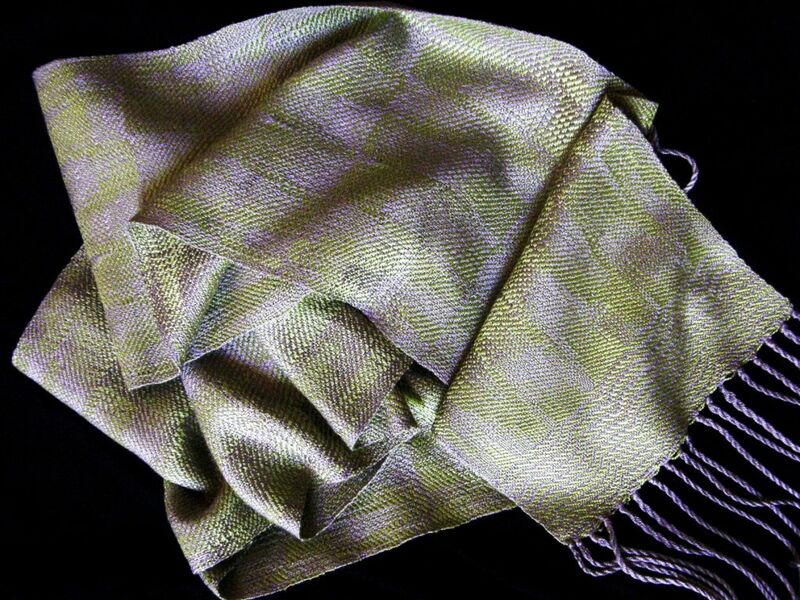 My camera has somewhat softened the pretty tones of green in this scarf but I hope that it gives you an idea of its wonderful flowing liquid silkiness. This was made by Helen in an advancing twill structure. This was Show and Tell and I got to keep it! It is just the kind of light weight scarf that I can really use. Beautiful! Yesterday I went out to Dace’s home. Dace had invited me to her home for a morning of dyeing. 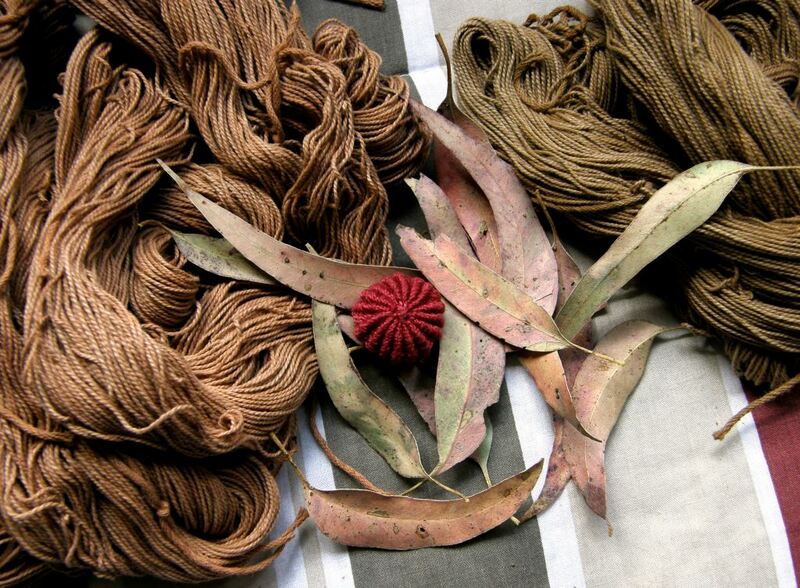 The Mission: take home cotton yarn that had been dyed with native Australian plants. I would like to weave something that represents my trip and this seemed like a good way to start. Fortunately, I had taught myself from an experience many years ago that cotton and wool take color very differently. 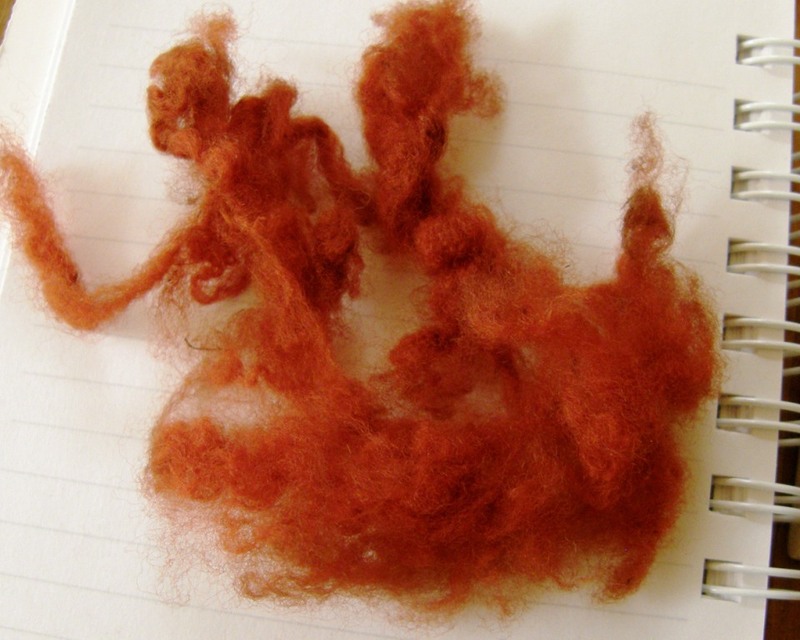 I had been wooed by the sight of the most amazing shade of orange that Dace had achieved when dyeing wool with leaves from a certain kind of eucalyptus (see left). I knew not to expect anything like this kind of intensity from cotton. Two of the ladies at the gathering at Helen’s house advised me to mordant my thread with diluted soy milk which I did. Dace’s home filled with the gorgeous aroma of eucalyptus as the pots boiled on the stove. It drove her husband and cat away for the day! You can see the tree from which Dace took leaves and bark below right. She told me that it is one of the “box” varieties of eucalypt. This was another fascinating piece of Show and Tell. Dace had taken the NSW guild’s summer school class lat January on buttons and produced all these over the course of four days. I was especially interested in the ball-like buttons upper left which so resembled the little coil stitch pom-poms that Bolivian weavers sometimes have dangling form their ch’uspas, coca leaf bags. Dace gave me enough information to be able to come home and make one…fun! 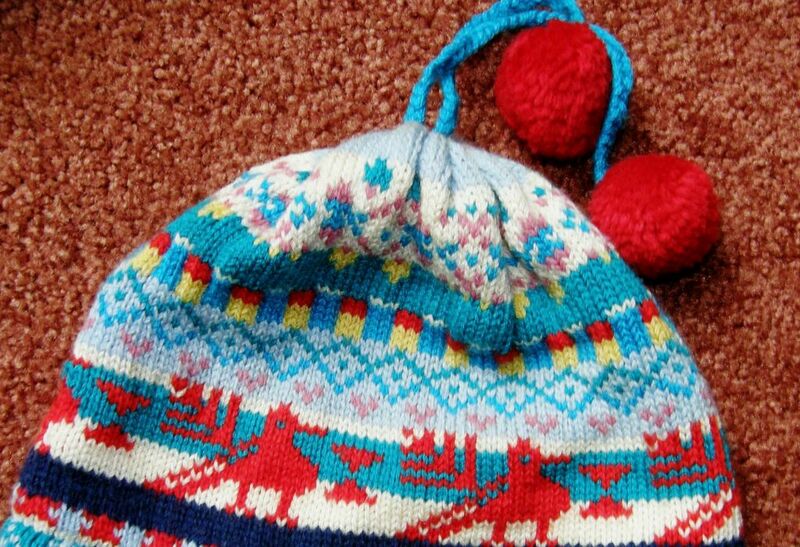 The Bolivian pom poms can be made in multiple colors whereas these ball-like buttons cannot. There you can see my button (made with wool) nestled between my dyed skeins. The skens on the left came from the leaf pot and the other from the bark. Okay, so they are not the most brilliant tones in the world but…mission accomplished. 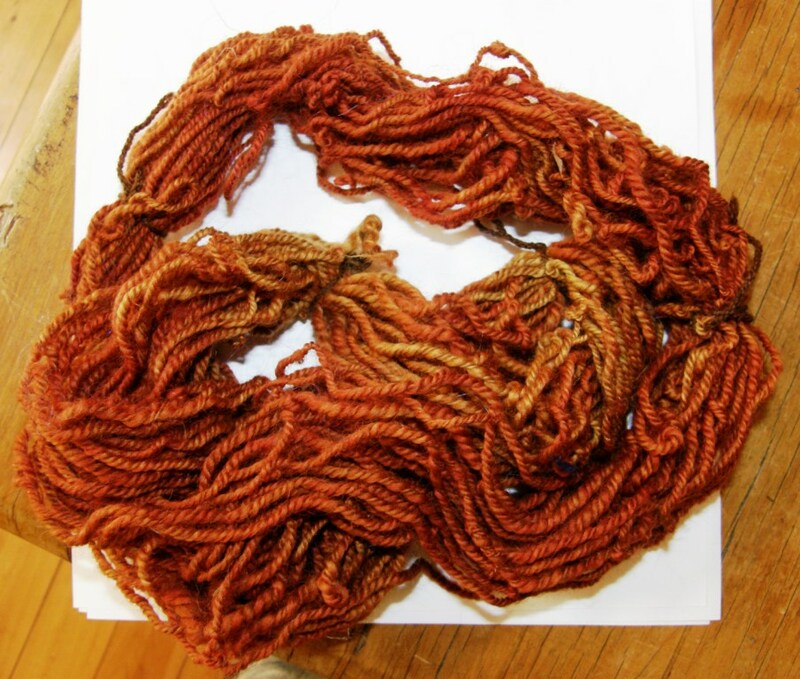 I have cotton dyed with native Australian plant material. And I will take home the happy smells of the Austraian bush which have not faded after rinsing. Dace told me to use vinegar with the rinse but I didn’t, not wanting to lose the eucalyptus smell. Those buttons! I am on a road trip to Canberra tomorrow to watch my nephew compete in a triathlon. Guess what I’ll be doing in the car and probably during the race! Dace is Latvian and, while talking about both our backgrounds, she came out with some Latvian bands that she had bought on a trip to her homeland in 2011. These are all woven with supplemental warps (and now I realize that we are probably not looking at the “good” face of the one on the left). I love the simple border on the third band from the left…so simple and so very effective. 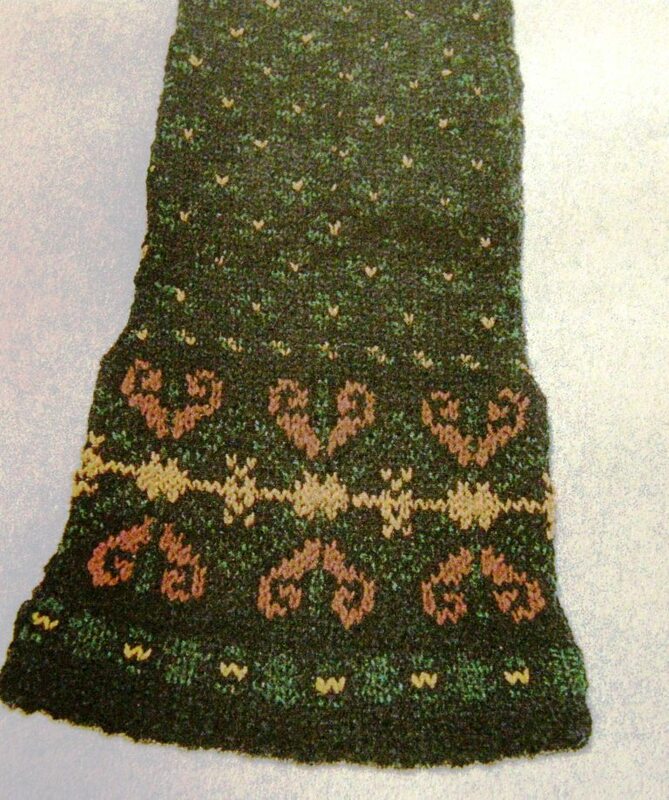 Dace showed me pictures of Latvian mittens and I loved this one with its hook design…a hook and its reflection…so like a classic Andean weaving motif which I am sure that many of you will recognize. 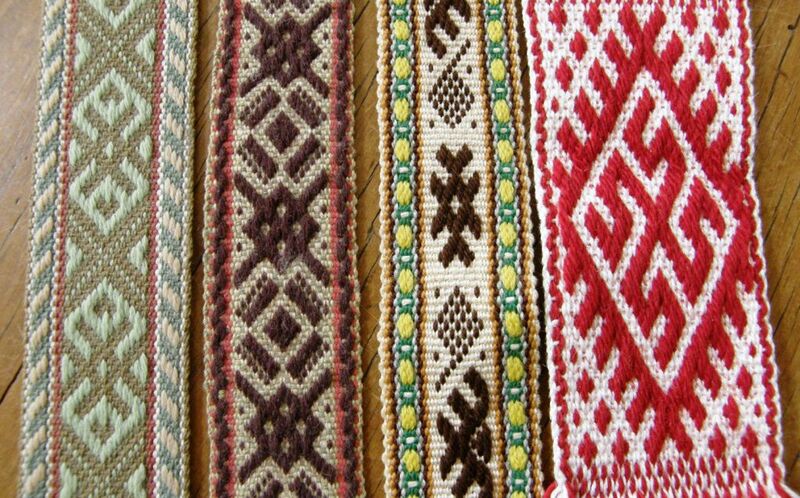 Speaking of Latvian bands, I made contact online with Sanita who very recently started a blog on Latvian band weaving. She is slowly constructing it and it promises to be very informative. So far, she has included pictures of bands with pick-up patterns using supplemental warps as well as (and this make me very excited) those which have used what I call the Andean Pebble Weave structure. Sanita confirmed the stucture by sending me charts of some of the patterns. I think I am edging a little closer to finding an answer to my questions about the use of this structure in the belts of the Russian Old Believers. Keep an eye on Sanita’s site. Well, I am off to make some more button/pom poms and can’t wait to have some dangling from my next woven pouch. I miss my loom and my big weaving…this is the next best thing until I get back to Bolivia. Speaking of pom poms, I will leave you with one last picture. I uncovered a relic from my past while going through boxes of “stuff” here in Australia. This is possibly the only surviving piece from the little knitting machine endeavor I had in my early 20s. I used to make hats and headbands by the dozens for skiers. It seems like I might have been trying to use up odds and ends of left over colors in this one! The thing that I like is the little South American-like bird motif that I chose to include. 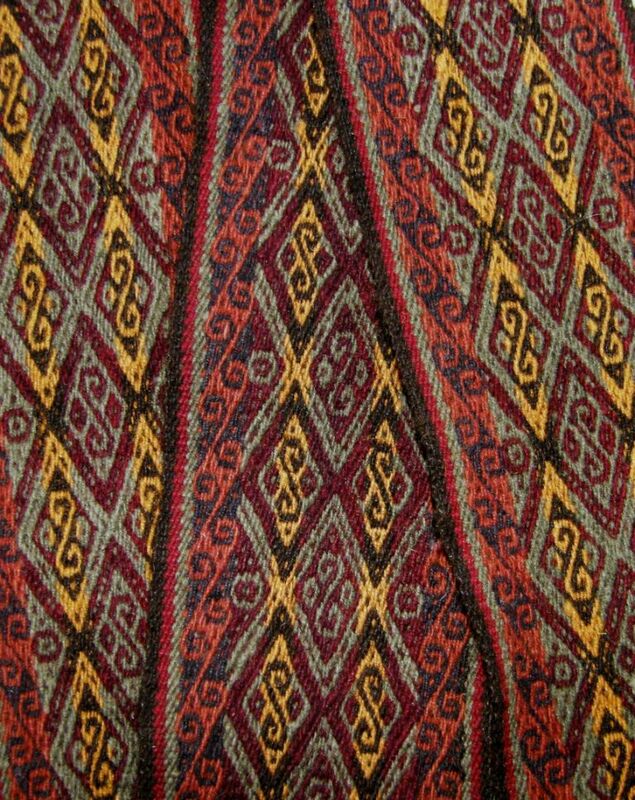 I have no idea about the origin of that motif but I think it is fun to see that many many years before South America and weaving became a part of my life, I had a definite interest in these kinds of patterns. « Backstrap Weaving – News and Novelties from Down Under. Love the hat. What a wonderful momento. What a surprise! In 1995 my daughter was a short-term missionary in Australia in the same area you are visiting. She brought me a broach she purchased at a church craft sale. It is the same design as the button at the center of the bottom row in your picture. The colors are very different from the one you pictured, but the design is the same. I love that you found the little bird on your earlier hat design!